Well, we've beaten the airborne Ebola angle into the ground but there is still a lot of confusion about what PPE (personal protective equipment) is actually necessary to protect oneself in an Ebola epidemic. It's a fair concern and I think it really depends on where you are. Risk in a Liberian clinic that's overrun with patients and only a few HCW (health care workers) is much higher than in a fully staffed modern western hospital with caregivers who are well rested and highly trained. In that case, it's not the virus that dictates precautions, so much as the environment. But what do you really need, in a real world epidemic situation, to be protected from Ebola? Well, this question has already been answered. In 1995, the town of Kikwit, Democratic Republic of the Congo and surrounding villages were the epicenter of a serious Ebola outbreak between January and June. During this outbreak 317 people were infected and 245 people lost their lives. In May of that year an international team was called in to help. This team did everything they could to effectively intervene: they went house-to house searching for patients, reviewed hospital and dispensary logs, performed retrospective contact tracing and interviewed everyone involved. One of the most interesting things to note about this outbreak is that a close look at the case definition showed that merely dying during the outbreak was as good a definition as any, with a 95% predictor of Ebola. In Kikwit, there were two powerful ways by which aerosol transmission of Ebola was ruled out and the necessary PPE was defined. "All secondary cases had direct physical contact with the ill person (rate ratio [RR], undefined; P,.001), and among those with direct contact, exposure to body fluids conferred additional risk (RR, 3.6; 95% confidence interval[CI], 1.9-6.8). None of the 78 household members who had no physical contact with the case during the clinical illness were infected (upper 95% CI, 4%)"
Did you catch that? Every secondary case was due to direct contact with a symptomatic Ebola patient. 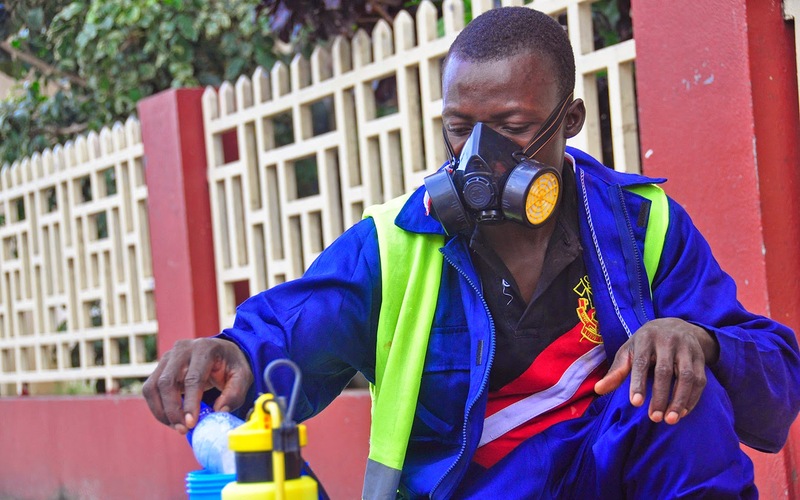 This is why it's so frustrating to see people in W. Africa without gloves, wearing respirators or covering their mouths and noses with their t-shirt, like this man in a WHO photo. They clearly don't know where the real danger is and we're not effectively helping them understand it. The second way in which aerosol transmission was ruled out in Kikwit was by the way they contained it. When Pierre Rollin got to the Kikwit General Hospital it was a mess. There were contaminated needles scattered around the floors, blood and other bodily fluids smeared everywhere. It was filthy and patients weren't being treated. No one was providing supportive care because they were afraid to start an IV or give an injection. Pierre initiated and supervised clean-up efforts, starting with PPE, and it got the outbreak under control. He gave the health care workers and family members the basics, including gowns, surgical masks and gloves and once that was implemented the transmission stopped. It. Stopped. The only case that occurred in that outbreak after that, occurred in a small nun-run hospital outside of Kikwit. They didn't have tyvek suits and PAPRs. 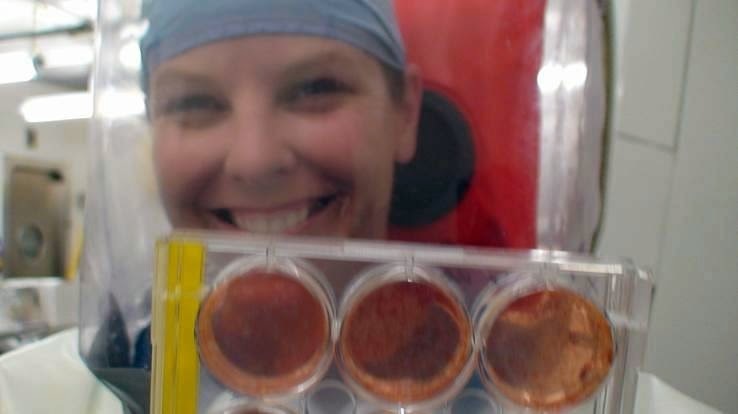 All they had was protection from liquids, not aerosols, and they didn't get any more infections. This was striking evidence that Ebola is not airborne. It also argues that when the basics are used early and used correctly, Ebola can be contained. 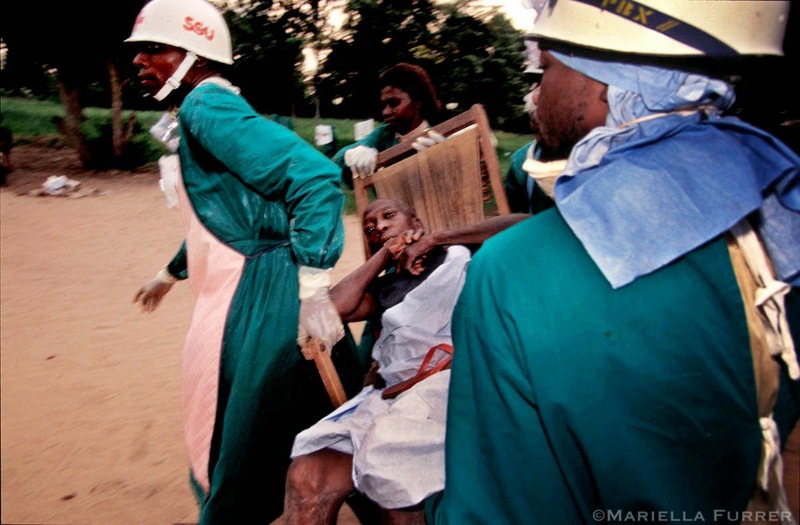 This was also the case for the Marburg outbreak in the DRC that occurred from 1998-2000. For me, this just illustrates how seriously under supplied W. Africa is. Had basic PPE been available at the beginning of this epidemic, things would have been different. But now we're behind it, unable to catch up and terrified people are lying about exposure and fleeing the area. Because of this, Ebola is going to keep killing a lot of people in Africa. There have also been three other Ebola cases treated in modern western hospitals that support this basic PPE requirement. 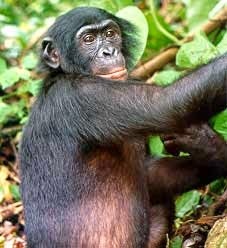 Before Kikwit, in 1994, a 34 year old female veterinarian working with a group studying chimpanzees in Tai Forest, Côte d'Ivoire, performed a necropsy on a dead wild chimp. Eight days later she got sick and was flown back to Switzerland and treated for what they suspected was Yellow Fever. She was cared for with no special precautions and she recovered. A sample from her was sent to the Pasteur Institute where it tested positive for Yellow Fever. So the sample was given to Bernard Le Guenno, a noted hemorrhagic fever virologist, so that he could isolate Yellow Fever for confirmation. Bernard did virus isolation but he didn't get Yellow Fever, he got Ebola. The Tai Forest species. Oops. By then, the patient had recovered and there were no secondary cases. The other two cases were in Johannesburg, S. Africa. A physician treating Ebola patients in an outbreak in Gabon in October of 1996 got infected and flew to Johannesburg without telling anyone. He was cared for at the Morningside Medi Clinic and in November recovered and returned home. No special precautions were taken for his care. During the placement of a central line in the Gabonese doctor, a nurse was exposed to a lot of blood and she became ill soon after, on November 2nd. By November 9th she'd not responded to any treatments and her symptoms were consistent with VHF. They suspected Crimean Congo. ***They sent samples to Bob Swanepoel, at what is now called NCID, to test for CCHF and his technician ran it against all VHFs. It turned out to be Ebola. Public Health then stepped in and transferred the patient to Johannesburg Hospital where she was cared for by Guy Richards and his team who used Ebola appropriate PPE. The nurse didn't make it. However, once again, with the initial absence of special precautions, there were no other secondary cases. So as you can see, there's powerful evidence that basic PPE to protect against fluids is actually enough to protect against Ebola. Unfortunately, in the current outbreak, there are very few HCWs, with very few resources, to care for an exploding numbers of patients. This leads to, and combines with, exhaustion to create an epidemic that's out of control. In addition, the inability to communicate that Ebola is in fluids, but not airborne is seemingly impossible. Many educated Americans I try to explain it to don't get it, so how can we expect a terrified population in the middle of the horror to understand? In all of the papers published regarding the Kikwit outbreak, there are recommendations for handling future outbreaks including containment, health care worker safety, patient physical and psychological care, and information campaigns to both educate people and prevent discrimination against survivors. It's all there. Apparently no one bothered to look for it. ***this was updated on Sept 7 2014 to include additional specifics that should clear up any confusion about how the nurse was treated or her samples tested. Thanks to Ian Mackay and Raina McIntyre for providing the missing pieces. Scott F. Dowell, RoseMukunu, Thomas G. Ksiazek, Ali S. Khan, Pierre E. Rollin and C. J. Peters forthe Commission de Lutte contre les Epidémies à Kikwit. Transmission of EbolaHemorrhagic Fever: A Study of Risk Factors in Family Members, Kikwit, DemocraticRepublic of the Congo, 1995. J Infect Dis. (1999)179 (Supplement 1): S87-S91. OyewaleTomori, Jeanne Bertolli, Pierre E. Rollin, Yon Fleerackers, Yves Guimard, AnnDe Roo, Heinz Feldmann, Felicity Burt, Robert Swanepoel, Scott Killian, Ali S.Khan, Kweteminga Tshioko, Mpia Bwaka, Roger Ndambe, C. J. Peters, and Thomas G.Ksiazek. Serologic Survey among Hospital and Health Center Workers during theEbola Hemorrhagic Fever Outbreak in Kikwit, Democratic Republic of the Congo,1995. J Infect Dis. (1999) 179 (Supplement 1): S98-S101. AliS. Khan, F. Kweteminga Tshioko, David L. Heymann, Bernard Le Guenno, PierreNabeth, Barbara Kerstiëns, Yon Fleerackers, Peter H. Kilmarx, Guenael R.Rodier, Okumi Nkuku, Pierre E. Rollin, Anthony Sanchez, Sherif R. Zaki, RobertSwanepoel, Oyewale Tomori, Stuart T. Nichol, C. J. Peters, J. J.Muyembe-Tamfum, and Thomas G. Ksiazek for the Commission de Lutte contre lesEpidémies à Kikwit. 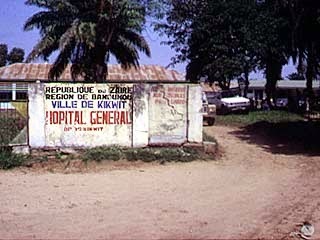 The Reemergence of Ebola Hemorrhagic Fever, DemocraticRepublic of the Congo, 1995. J Infect Dis. (1999) 179 (Supplement 1): S76-S86. Matthias Borchert, Sabue Mulangu, Pierre Lefèvre, AntoineTshomba, Modeste L. Libande, Amayo Kulidri, Jean-Jacques Muyembe-Tamfum, andPatrick Van der Stuyft. Use of Protective Gear and the Occurrence of OccupationalMarburg Hemorrhagic Fever in Health Workers from Watsa Health Zone, DemocraticRepublic of the Congo. J Infect Dis. (2007) 196 (Supplement 2): S168-S175. J. J. Muyembe-Tamfum, M. Kipasa, C. Kiyungu and R.Colebunders. Ebola Outbreak in Kikwit, Democratic Republic of the Congo:Discovery and Control Measures. JInfect Dis. (1999) 179 (Supplement 1): S259-S262. Thank you for the professional and, no doubt, lifesaving web-page. Bur please explain, if possible, why aerosols, originating from the victim, are non-infective, while direct contact with the victim can transmit infection. I do not debate your conclusions, but on the surface it seems counter-intuitive given the biological truism that most organisms survive longer in fluid. Hi JP. Thank you for stopping by and thank you for the question. I think this has been well explained in my post called "Debunking Airborne Ebola". It might be easier for you to read that, than for me to provide a lengthy explanation here. I would like to clarify one thing here though. Ebola is aerosol infectious, but it is not spread by aerosol. That means that aerosols originating from the victim can potentially be infectious when expelled. However, the data suggests that this infectivity is not long lived - not long enough for the virus to remain infectious after it is carried on an air current. If the aerosols touch your mucus membrane immediately upon expulsion, there is high risk of infection. However, there have been no cases in which someone in the same room was infected in the absence of this direct contact. So, for some reason, the virus cannot remain infectious long enough in airborne aerosols to be spread by an airborne route. By "direct contact" Ebola scientists usually mean droplet-to-mucus membrane transmission. In addition, Ebola patient sweat is very infectious at later stages of the disease. Touching the skin and then touching your nose, eyes or mouth can cause infection. I hope this helps. Thank you so much! And thank you for the question. You bring up a lot of interesting points, and I can just imagine your fear during that outbreak! You definitely did the right thing. So far, there really is no evidence that this variant of Ebola Zaire is any more easily transmitted than has been seen in previous outbreaks. Dr. Tom Ksiazek recently returned from Sierra Leone where he led the CDCs response efforts for 6 weeks. He gave a talk afterward in which he provided some insight into this. The problem with HCW infections is either lack of PPE in high risk situations, inadequate training to use PPE, and more importantly inadequate training in removal of contaminated PPE. In addition, there is a serious lack of supervision. Before any foreign relief efforts other than MSF (who've had very few infections) were in place, the lack of HCW made not only caring for patients impossible, but also that there was little to no supervision to make sure proper techniques were being used. One additional thing to keep in mind, is that the Ebola ward, where the most PPE is worn, is not the only place that HCW can get exposed. When a majority of infectious patients are not in clinics, but are either outside waiting, or being triaged for something else, or maybe just in the community in early (but symptomatic) stages, it's very easy for anyone in the city, including HCWs without PPE, to get exposed. As for your question regarding the virus "weakening" with transmission, I've not heard of that. It is more likely that awareness, infection control measures, and early intervention for the sick, got better over time during the outbreak.